Racism is a fierce, ever-present, challenging force, one which has structured the thinking, behavior, and actions of individuals and institutions since the beginning of U.S. history. To understand racism and effectively begin dismantling it requires an equally fierce, consistent, and committed effort. This event is hosted by the Anne Arundel County Partnership for Children, Youth and Families and Anne Arundel Women Giving Together. Upcoming events our members are engaged in. We invite others to join AAWGT to participate with us. Start The Adventure In Reading (STAIR) Annapolis, Inc. focuses on one thing – READING! The organization aims to fill a need that parents and school staff may not fill: one-on-one reading time with at-risk students on regularly scheduled days. Through second grade, students learn to read. Once they reach third grade they read to learn. If a child cannot read well by third grade, their educational life becomes more challenging. The result may be that they eventually drop out of high school, which may lead to joblessness, and worse. Each year STAIR begins with only 9% of second graders in the program reading at grade level, and by year-end, better than 65% of program students are reading at or above second grade level. Spending time with a warm and caring adult, one on one, allows each student to increase his or her self-esteem and self-confidence. Last year the STAIR program graduated 81 students, almost all of whom wanted to be the one to read FIRST! That’s a vast difference from how the year started. On September 25th, STAIR began its 13th year and is set to tutor 90 - 100 students. STAIR could not exist without its 160+ volunteer tutors, many of whom return every year to one of the program’s 10 sites in AA County. Volunteers are well trained to engage their students in one-on-one tutoring sessions. A curriculum enriched with a variety of supplies, books, and games lends structure. Site coordinators support each site, assisting tutors and prepping the space for students. They place volunteer tutors where the need is greatest. Tutors work two afternoons a week with the same student for the entire school year at sessions that are tailored to the student’s pace and ability. Tutors are the biggest asset for the site coordinators, who focus on keeping trained and committed volunteers. AAWGT’s 2017 grant provided salary support to the executive director, site supplies that go home with the students at year end, books to build students’ home libraries (STAIR gave away close to 3,000 books this past year), healthy snacks for hungry readers, and support for the new Severn Elementary STAIR site. STAIR at Severn Elementary won the Award for Exemplary Volunteer Program for the Northeast & Old Mill Region from Anne Arundel County Public Schools. None of this could happen without the generosity of all at AAWGT. More than that, several AAWGT members are tutors, giving of their time to work with students who deserve a chance in this world! 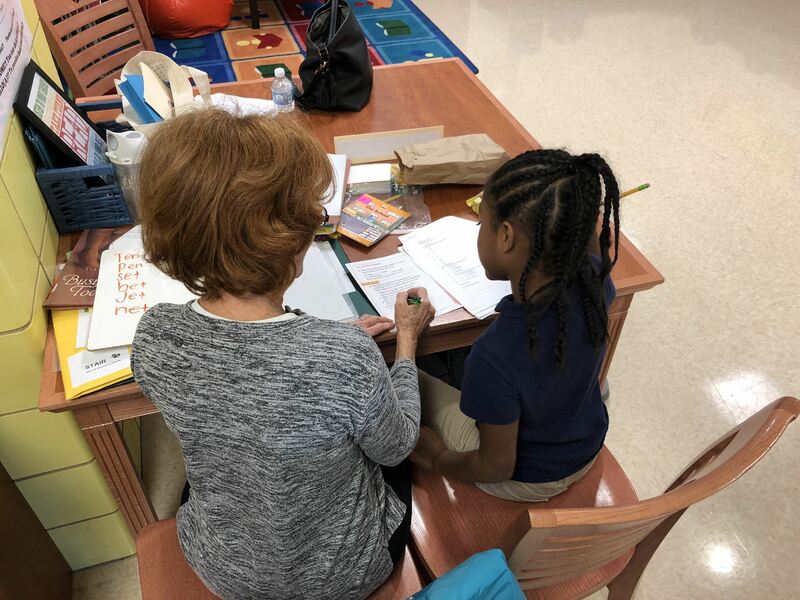 With AAWGT Momentum Grant funding, STAIR will work toward four goals: expand staff by adding a volunteer coordinator, tutor more students in the City of Annapolis, impact STAIR parents by training them in the basics of helping their student to read, and expand tutor training. The Momentum Grant has allowed STAIR to take the first step toward its two-year goals having welcomed Malena Ruland, the new volunteer coordinator, on September 1. The organization is excited about the opportunities that will present themselves over the next two years. HOPE’s 14,000 square foot warehouse in Glen Burnie is filled with donated and purchased inventory. HOPE’s team of eight staff and 120+ volunteers helps serve families and individuals living in poverty who are unable to afford beds and basic goods. About 25 qualified household referrals are sent to HOPE monthly by government, nonprofit, and Anne Arundel County school partners identifying families in need. Through an in-home visit to each household, HOPE’s volunteer team often sees adults and children living in substandard environments with no beds, furniture, lighting, or other essentials. The team works with each family to determine what they need to establish a healthy home. Returning to the warehouse, staff and volunteers collect purchased and donated furniture and clothing for each client and then arrange for HOPE’s truck to deliver them. No other nonprofit in Anne Arundel County provides and delivers this range of needed goods at no cost. In reality, HOPE for All provides hope and expectation that a home outfitted with life’s essentials will be the foundation for a new beginning and second chance. One of this year’s clients exemplifies this optimism. With great joy a couple with three young sons met HOPE volunteers at their “new to them” townhouse.This was the first place they could call home after over a year of living in hotels and with friends. Both parents are employed and working hard to establish independence. After thanking HOPE for their help, the entire family sang a gospel rendition of “He’s a Chain Breaker” for the volunteers. One volunteer said it was both humbling and an honor to be there, “in the presence of something greater than myself.” Tears were shed, the homelessness chain was broken, and hope was born. HOPE for All seeks donations of dressers, basic furniture, household items, and clothing. Financial support—in addition to the grant provided by AAWGT—is also sought, as the needs of county residents continue to be high. AAWGT member Tara Clifford received Volunteer of the Year. 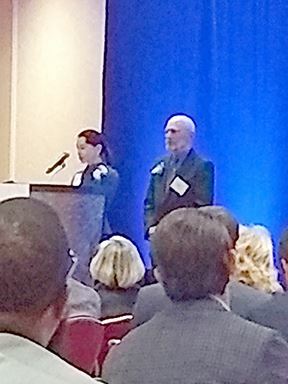 AAWGT member Bev Marcus and her husband, Stephen, were recognized as Philanthropists of the Year. AAWGT members at the luncheon. Second graders sounding out words. Student drummers performing. Elementary school students working on art projects. 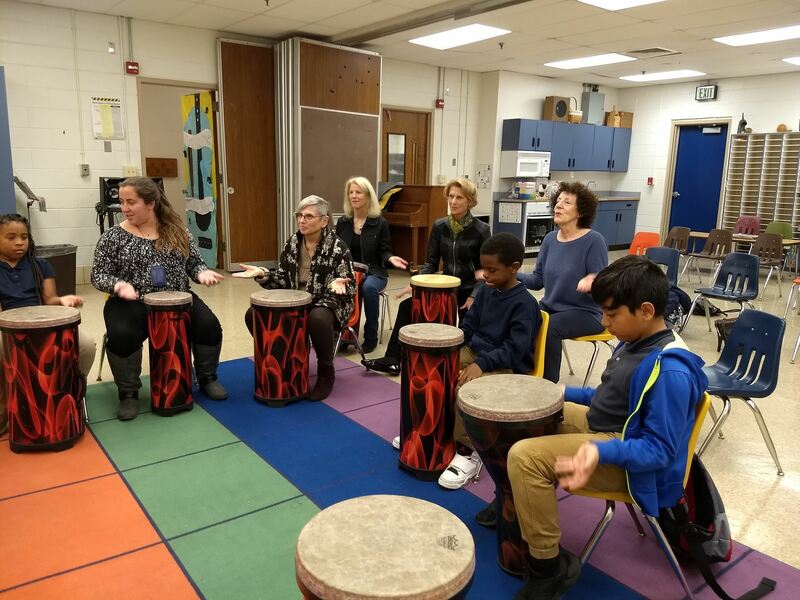 AAWGT members saw their grant dollars in action during the annual Fall Field Trip, where they visited five Start the Adventure in Reading (STAIR) sites and two Creating Communities sites. 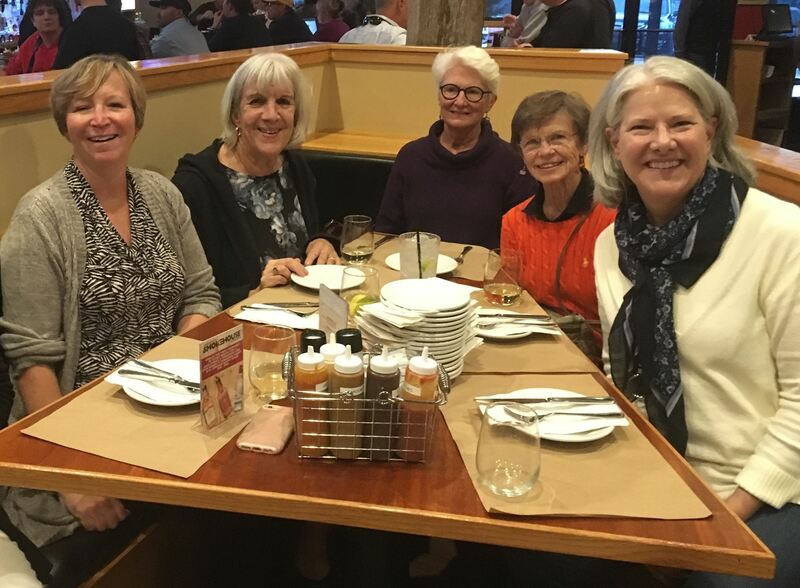 Over 30 members participated in the events, which included happy hour at a local restaurant. This is my last Leadership Letter as president. Thank you for the privilege of serving you, a fantastic group of generous, committed and smart women who have made substantial contributions to the lives of women and families in our county. 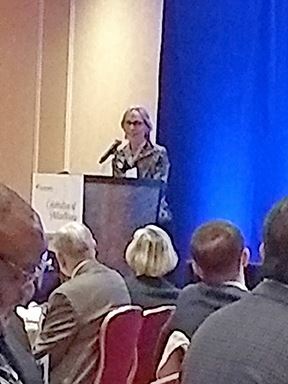 Thank you to our vice president/incoming president, Sue Pitchford. Sue has been more than a partner, and I know she will continue to build on the momentum generated this past year. What has happened? We reached the $1 million mark in grants distributed over our 12-year history, we brought in new members, and we welcomed the public to excellent education programs. We introduced the two-year Momentum grant and identified promising non-profits with annual grants. With the leadership of our immediate past president, Linda Eggbeer, we formed an ad hoc committee to launch a pilot project of corporate sponsorships in 2019. Thanks to all of your who served on committees — they function oh so well. “Social impact can be achieved by keeping a problem from getting worse.” That may seem discouraging but in fact is good to know if we try to measure success. “Options to consider for the future: polish and stay the same, change the model, or seek high growth.” As we move forward, we can keep talking about this. I do think we have done a lot of polishing—a tribute to the quality of the original product our thoughtful founders created. Thanks to all of you who are committed to helping the women and children of Anne Arundel County. I hope you find this involvement as rewarding as I do.